With “Our New Girl,” a show that’s ostensibly about a nanny that shows up unexpectedly on an overwhelmed (and very pregnant) mother’s doorstep and then insinuates herself a little too far into the family, playwright Nancy Harris has crafted a many-layered script, touching on privilege and upward mobility, the challenges of being a career-oriented woman with children, the savior complex of some Westerners and a number of other interpersonal themes. There’s a lot to take in. 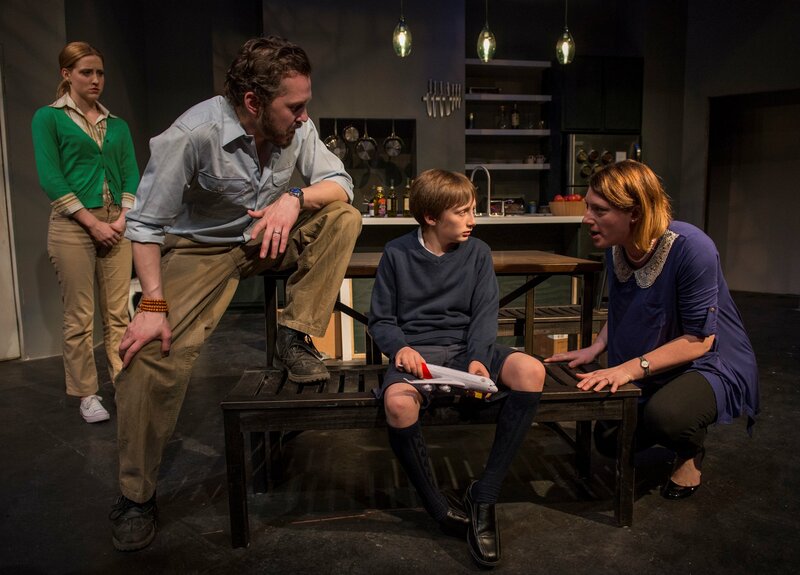 Unfortunately, Profiles Theatre’s Midwest premiere, which certainly nails the slowly building dread and anxiety inherent to the script (Jeffrey Levin and Oliver Hickman’s music works frightening wonders here), doesn’t capture many of these deeper layers. “The last thing I want is a nanny,” declares harried mom Hazel (Sarah Chalcroft, in a powerfully nuanced performance) when wide-eyed Annie (Miriam Canfield) arrives at her door in the opening scene. As it transpires, Hazel’s plastic-surgeon husband Richard (Layne Manzer) has hired Annie before going off the grid in Haiti for his latest round of humanitarian work. It seems the couple’s troubled (or maybe troubling?) son Daniel (a subtly stoic Killian Hughes) has become too much for Hazel to handle on her own. Though the fast-paced story almost carries the day, this initial scene shows the cracks that trouble this production throughout. By setting up interactions where characters full-on yell at each other for several minutes and spend far too much time standing very close together, director Joe Jahraus has taken a lot of the air out of the potential suspense. He has also steered Canfield astray—her Annie is aggressive and openly assertive, challenging Hazel’s dominance the minute she walks in the door. A coy and calculating Annie is much more dangerous. Hazel may be overwhelmed, but she’s the kind of intelligent, powerful woman (previously up for partner at her law firm) that would abruptly shut down a direct attack—the danger for her is in the supposed naivete and guilelessness that her new nanny puts forward. Profiles Theatre, 4139 North Broadway, (773)549-1815, profilestheatre.org. $35-$40. Through June 28.